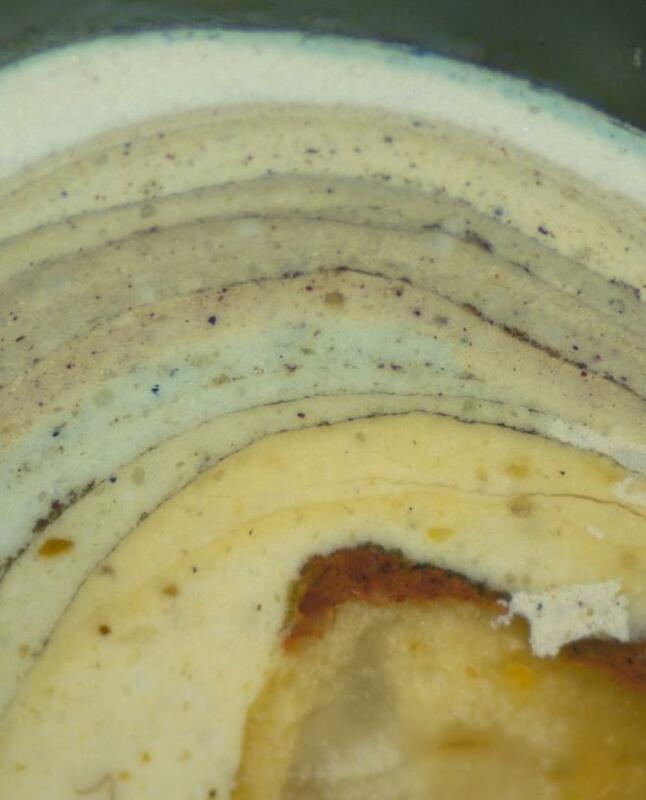 Paint analysis combines a microscopic examination of paint samples and document-based research to determine when successive layers of paint were added to a surface. Since those early days, the MVLA resolved that the goal is to best represent the rooms (and the estate at large) as they were at the time of George Washington’s death. As early as the 1930s, primitive forms of paint analysis were performed, primarily scrape tests combined with visual inspection. This approach often revealed a color, but it failed to account for the fading of pigment, or the yellowing caused by the aging of the linseed oil used as a binder. This led to the belief that early paints lacked vibrancy. Changes made to the Chintz Room based on recent paint analysis. Layers of Paint from Mount Vernon's Central Passage. MVLA. Multiple layers of fill in a hardware hole. 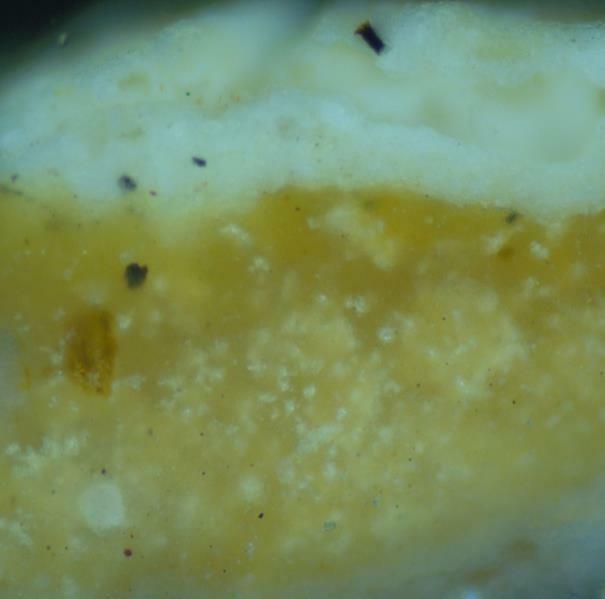 The yellow material is degraded linseed oil and lead white putty and the white material above is a modern fill material. These were identified based upon the use of different types of light and crushing/testing part of the sample. MVLA. For example, a significant accumulation of dirt on top of a substrate or paint layer indicates that a fair amount of time passed before a subsequent paint layer was applied. Or, if a layer contains zinc oxide (which replaced the more toxic white lead contained in early paints), it must post-date 1845, when paint containing this component became commercially available in the United States. Or, certainly, a latex paint could not have been applied during the 18th century, as it did not come into use until the 1940s. 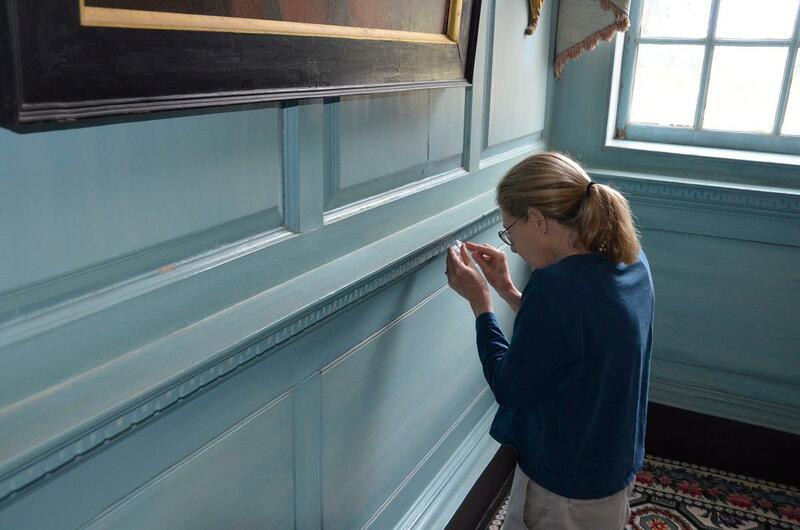 In concert with the microscopic examination results, Mount Vernon’s team performs research to determine if documentary evidence exists that speaks to the timing of paint campaigns. Or, even better, the year or time period a particular color was applied. In some cases, records clearly indicate the date that new paint was applied in a specific space. In other cases, clues allow for a time period or relative sequence to be identified. The recent front parlor restoration illustrates all of these scenarios. Paint sample from the Front Parlor which shows all 15 layers. The reddish-brown (darker) spot at the bottom is the first paint layer and the opaque area below it is plaster. Around the middle are two bluish layers. MVLA. Paint samples from the Front Parlor identified blue paint at layers six and seven in the paint stratigraphy. These two layers were preceded by several layers of cream colored, oil paint and followed by a layer of pinkish cream paint. An 1877 magazine article noted that the room was painted blue at that time. The documentary records of the 1879 room restoration also confirmed that the paint applied at that time was changed to a light color. Therefore, the combination of paint analysis and research allowed for the dating of layer seven (blue) as circa 1877 and layer eight (pinkish cream) as 1879. By extension, layer six (light blue-gray) could not have dated to the 18th century as it would have had to be on the walls for multiple decades, but there was not a significant accumulation of dirt on top of it. Further, the first layer could be dated alongside the installation of the wood paneling between 1758 and the early-1760s. After that initial painting, there was documentary evidence for three more paint campaigns before Washington died in 1799. 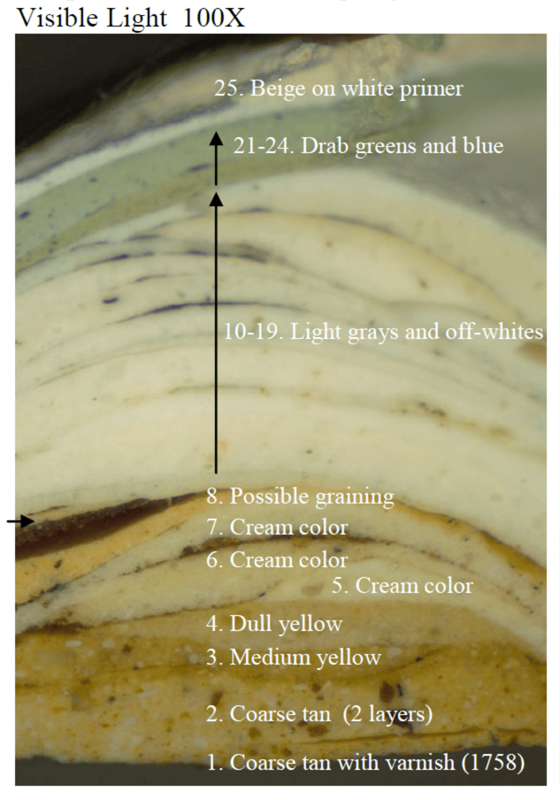 Thus, by both backing into and building up to the stratigraphy sequence, one of the early cream layers could be firmly identified as the 1790s paint color (as was suspected in the 1930s sampling). Hannah Freece, Ann Pamela Cunningham, Mount Vernon Ladies' Association, June 19, 2013, http://mountvernonnewroom.tumblr.com/post/53375534804/ann-pamela-cunningham. Hannah Freece, An Interview with Susan Buck, Conservator and Paint Analyst, Mount Vernon Ladies' Association, February 6, 2013, http://mountvernonnewroom.tumblr.com/post/42430308569/an-interview-with-susan-buck-conservator-and. Susan L. Buck, Cross-Section Microscopy Report: Mount Vernon Small Dining Room Paint Analysis, 1-2. Susan L. Buck, Cross-Section Microscopy Report: Mount Vernon Small Dining Room Paint Analysis, 2. Hannah Freece, An Interview with Susan Buck, Conservator and Paint Analyst.